The CT/SPECT Core Facility provides high resolution non-invasive, in vivo imaging and quantitative analysis g-emitting nuclides conjugated to cells, receptor ligands, drugs, or nanoparticles for biodistribution or cell tracking studies using x-ray computed tomography for localization of bone and tissues. Data acquisition may be done by either high resolution 3-D tomographic imaging or 2-D planar imaging. For tomographic imaging, multi- or single-pinhole collimators of 1.0 mm and 0.5 mm are available. Planar imaging is achieved with 3 different collimators with high, medium, or low resolution which correspond to the lowest, middle, and highest levels of detector sensitivities, respectively. Data acquisition is achieved with the dual Flex Triumph CT/SPECT instrument (TriFoil Imaging). The system (see figure below) is comprised of rotating gantry to which is attached a gamma-emission detector camera, an x-ray tube, and a CT detector interfaced with 3 computer work station fitted with the manufacturer's digital analysis software. The SPECT gamma-camera incorporates an array of 5-by-5 solid state cadmium/zinc/telluride (CZT) modules, each with 1.5-mm (0.06-inch) pixel array of 16 x 16, providing a total of 80 x 80 pixel array within a field of view of 12.7-cm by 12.7-cm (5-inch by 5-inch). The capacity to resolve energy resolution of 4.6% enables dual isotope imaging capabilities that is impossible to duplicate using most other imaging systems. The x-ray tube and detector on the rotating gantry are designed to fully circle around the bed to acquire a tomographic image of the subject. The x-ray detector is complementary metal oxide semiconductor (CMOS)-based device, having a 2240 X 2368 pixel matrix with a 50 mm pitch to yield a 12 mm x 12 mm (4.72 inch x 4.72 inch) field of view. The CT/SPECT system is capable of detecting cells, pharmaceutical probes, or antibodies labeled with the g-emitting isotopes. The instrument is currently calibrated to evaluate products labeled with 123I, 125I, 99mTc, and 111In, but can be calibrated for other isotopes. A four station anesthesia apparatus is available to deliver isoflurane in an oxygen mixture as an inhalation anesthesia. For tomographic images, anesthetized animals are placed on a heated bed, restrained, and attached to a pillow sensor which is interfaced with a respiratory monitor. Initially, to acquire a CT, the x-ray tube and detector are engaged, the gantry is rotated 360° and 128 x-ray exposures are acquired within 2 minutes. Then to acquire SPECT images, the gamma camera is positioned as close as possible for greatest detector sensitivity and for appropriate field of view. The gantry is again rotated 360° and up to 64 equiangular exposures are taken. Individual angular exposure times may vary from 8 to 999 seconds depending on the strength of the gamma-emitting signal, the detector sensitivity, and the field of view; the latter two parameters being the function of the radius of rotation of the camera. In practice, total acquisition times per animal for most studies range from 15 to 60 minutes. The field of view for an anaesthetized animal ranges from 4 to 164 cm2 with spatial resolution inversely correlated with increasing field of view. Data from single or multiple probes can be acquired simultaneously. Radiolabeled cell migration into areas of neuronal injury in disease models have been assessed for homing under nonpathogenic homeostatic conditions. Planar acquisitions allow rapid (seconds to minutes) exposure times to assess biodistribution in two dimensions. Planar SPECT imaging can be utilized to assess distribution kinetics of radiolabeled pharmaceuticals or toxicants and, upon equilibrium, tomographic imaging can assess the 3D spatial distribution of the drug. Top panels: FLEX Triumph CT/SPECT system overall dimensions are approximately 90" x 58" x 48". With the bed extended, the subject can be loaded and prepared while the heated bed is positioned at the front side of the CT/SPECT. 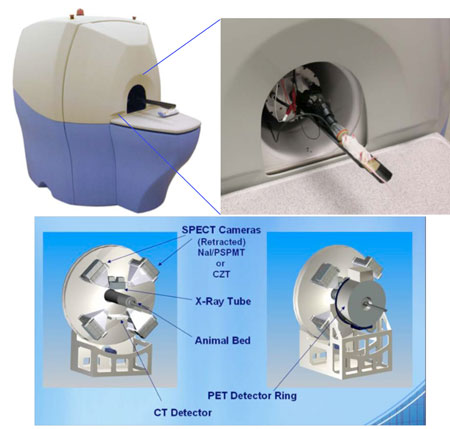 Bottom panel: Components of the FLEX Triumph include a CZT gamma camera, X-ray tube, and CT detector mounted to a moving gantry. The instrument can be upgraded to include a PET detector ring.